Mental illness is a cruel affliction whose victims include both the patient and the family. 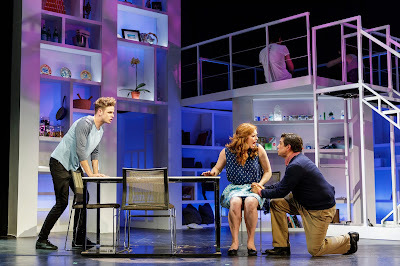 That point is stressed in “Next to Normal,” the musical being given an outstanding production by Broadway By the Bay. Diana Goodman (Caitlin McGinty) has been suffering from apparent bipolar disorder for some 16 years. Her loving, supportive husband, Dan (Joe Hudelson), has stayed by her side throughout her ordeal, taking her to doctor after doctor in hopes of helping her. Because so much attention goes to Diana, their teenage daughter, Natalie (Mackenzie Cala), tries to compensate by being perfect in everything she does, especially her studies and classical piano. Consequently, she’s highly stressed until a stoner classmate, Henry (Joey Pisacane), befriends her and tries to get her to relax with pot. Instead she goes off the deep end by raiding Mom’s medicine cabinet and downing anything she can find. Henry remains supportive, just as Dan has been with Diana. The fourth family member, teenager Gabe (Sean Okuniewicz), wields much influence on Diana and might have been the catalyst for her illness. Completing the cast is Brendan Quirk. He’s first seen as Dr. Fine, who plies Diana with pills that make her feel worse. Next he’s Dr. Madden, a celebrity psychiatrist who tries talk therapy, but when that doesn’t help, he resorts to electroconvulsive therapy, which helps somewhat. Astutely directed by Jasen Jeffrey, the acting is first-rate, especially by McGinty, who embodies Diana’s unpredictability and vulnerability. The performers also sing well individually and together. The one exception is Pisacane as Henry. Some of his songs might be out of his range, or he might have been suffering a vocal indisposition in the reviewed Sunday matinee. BBB artistic director Alicia Jeffrey (she and Jasen Jeffrey are married) is musical director and conducts five other musicians from the piano. Design elements are noteworthy, especially Kelly James Tighe’s two-story set with modular display niches, and Michael Oesch’s dramatic lighting. Costumes are by Leandra Watson with sound by Jon Hayward. The show features tuneful music by Tom Kitt with the book and lyrics by Brian Yorkey. The book is so strong that it could stand alone as a play, as attested by the show’s 2010 Pulitzer Prize for drama as well as three 2009 Tony Awards. Although mental illness is off the beaten path for a musical, “Next to Normal” takes a sensitive, respectful approach and -- after all the family’s difficulties -- ends with a ray of hope. Running about two hours and 15 minutes with one intermission, it will continue through Aug. 27 at the Fox Theatre, 2215 Broadway St., Redwood City. For tickets and information, call (650) FOX-7770 or visit www.broadwaybythebay.org.